Journey through the best of Central Highlands much written about in Capt J Forsyths – Highlands of Central India covering Satpura and India’s top two parks for Tigers. Kanha’s grasslands are home to the only surviving population of Hard Ground Barasingha & Bandhavgarh offers the best chance to come face to face with the Tiger. Satpura is best known for Sloth Bear, Leopard, Wild Dog & Crocodile. Denwa Backwater Escape is located overlooking the mesmerizing backwaters of a dam built on Denwa River in Satpura National Park, the area is popularly known as Madhai. It is built on 10 acres of forested land along the river and across the river is the national park which is approached by a boat and then by jeeps to go deeper into the forest. The lodge offers stunning views of the Denwa River, grasslands across and rolling Pachmari hills. Satpura National Park is spread over 1427 sq km and was formed in 1981 after joining Satpura, Pachmari and Bori sanctuaries and is a unique habitat from about 200 feet to 4000 feet. The terrain of the national park is extremely rugged and consists of fascinating deep valleys, sandstone peaks, narrow gorges, rivulets, waterfalls, thickly dense green forest of Sal and other medicinal herbs, it also has large tracts of Teak forests. Its common fauna comprises Spotted Deer, Indian Bison(Gaur), Tiger, Leopard, Wild Boar, Wild Dog (locally called Dhole), Sloth bear, Black Buck, Sambhar, Four Horned Antelope (Chowsingha), Marsh Crocodile, Malabar Squirrel & Langur Monkey. It offers good birding opportunity due to its unique terrain and many water bodies including the Tawa reservoir. Kanha Earth Lodge is spread in a forested area of 16 acres adjoining the buffer zone of Kanha in a small tribal hamlet. The lodge architecture has been inspired by the Gond tribal villages situated on the fringes of Kanha. The lodge has been built with high standards towards eco sensitivity, local village cooperation and a great wilderness experience. As a conscious decision the lodge is situated remotely, away from the tourism hub, yet close enough for an easy access to the park. Kanha Tiger Reserve's spectacular Sal and Bamboo forest, rolling grasslands and meandering streams stretch over 1945 sq. km. in the heart of central highlands. This is the original Kipling country so fondly written about in his Jungle Book. The park is the only home to the rare hard ground Barasingha found in its large grasslands. Kanha is also home to Tiger, Leopard, Sloth Bear, deer, ungulates, lesser cats and over 250 bird species. Kings Lodge is nestled between Sal forested hills of Bandhavgarh National Park in a large natural forested estate of 14 hectares in a small tribal village. Kings lodge is environmentally sensitive, harmonious with the natural features of the site and accentuates natural daylight to all facilities. Local knowledge and art has been incorporated in the development and the lodge has been constructed using local manpower. Our guests benefit from our incredible location, outstanding hospitality, an experienced naturalist team, our commitment towards conservation and local communities. Day 01: Satpura National Park Arrive Denwa Backwater Escape for lunch. Evening boat safari on River Denwa. Day 02: Satpura National Park Morning and evening jeep safari in Satpura Tiger Reserve. Day 03: Satpura National Park Morning elephant or walking safari inside Satpura Tiger Reserve. Late evening jeep safari in buffer zone to spot nocturnal wildlife. Day 04: Satpura – Kanha Post breakfast drive 7 hours to Kanha Tiger Reserve. Packed lunch will be provided for the journey from the lodge. Dinner and overnight at Kanha Earth Lodge. Day 05: Kanha National Park Morning and evening Jeep Safari in Kanha Tiger Reserve. Day 06: Kanha National Park Morning and evening jeep safari in Kanha Tiger Reserve. Day 07: Kanha - Bandhavgarh National Park Post breakfast drive 5 hrs to Bandhavgarh National Park. Evening at leisure followed by dinner at Kings Lodge. Day 09: Bandhavgarh National Park Morning and evening jeep safari in Bandhavgarh Tiger Reserve. Day 10: Bandhavgarh National Park Post breakfast, transfer for further connections. Tour cost: USD 1970 per person on twin sharing. Above tour rate is valid till 30th June 2019. Book 130 days in advance and get 10 % off on total tour cost. Get 20 % off for travel between 6th January 2019 to 21st January 2019. Get 20 % off for travel between 1st May 2019 to 30th June 2019. New year night supplement (31st Dec) USD 50 per person. For Indian nationals, please email us for a quote to enquiry@pugdundeesafaris.com or call us on +91-8800637711, +91 - 124 - 2970497, 2570404. Twin sharing accommodation in lodges as per program. All meals (breakfast, lunch and dinner) and tea/coffee service. Four shared jeep safaris in Bandhavgarh National Park with entry fees, jeep charges and guide charges included. Four shared jeep safaris in Kanha National Park with entry fees, jeep charges and guide charges included. Two shared jeep safari, one elephant or walking Safari, one boat safari in Satpura National Park & one late evening safari in buffer zone. Road transfers by air conditioned Toyota Innova from Satpura – Kanha –Bandhavgarh. Any airfare and transfers from the nearest airport or railway station and back. Any kind of personal expenses or optional tours, extra meals and beverages ordered. Insurance, laundry and phone calls. Bottled water, soft drinks and alcoholic beverages. Anything that is not included in the inclusions list (refer above). Above rates valid till 30th June 2018. Rates may differ during Christmas, New Years and special long weekends, please contact our reservations for details. 50% advance payment at the time of booking and balance 30 days before arrival date. No adjustments or refunds in case of not availing any facility from the package. Our lodges require a minimum 24 hrs prior notice to organize an airport/station transfer. In case of any urgent requests of such nature, we recommend our guests to contact the lodge or Delhi reservation office by phone. In keeping with our heightened security procedures we request all guests to carry a photo- identity to present at check-in. Foreign nationals are required to present their Passport and valid visa. Indian nationals can present any one of the following: Passport, Driving License, Voter ID card or PAN card. This should be the same as submitted at the time of safari bookings. Guests who have paid by online credit card will have to also sign a further authorization at the lodge on arrival and present the original card. Our standard check-in time is 1330 hrs and check out time is 1100 hrs local time. Subject to availability of rooms, we can offer you an early check-in and late checkout facility. For us to guarantee you an early check-in or late check out, you will need to reserve the room from the previous night. Park is closed on Wednesday afternoon and on Holi festival. The forest department may close the park due to rain also on short notice. 1 child below 5 years complimentary, others will be charged 25% of double's cost. Children between 5-12 years 25% of the cost of double package in the same rooms. Above 12 years at 40% the cost of the double package, if minimum 65% extra child supplement has been paid on automatic upgrade to 2 rooms will be provided, subject to availability. 20% cancellation will be charged on all bookings. Cancellation amount is calculated as per total booking amount and not as per advance deposited. Long weekend bookings like New Year, Christmas, Holi and Diwali are non refundable. Three parks each with its own unique habitat. 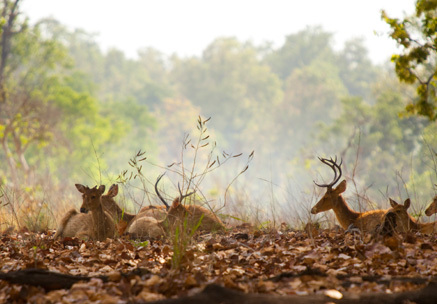 Kanha home to the last surviving population of Hard Ground Barasingha (Swamp Deer) & a healthy population of Tigers. Bandhavgarh is probably the best park for Tiger sightings in the world. Opportunity to explore parks on jeep, boat, elephant & foot. Services of an English speaking naturalist. Good opportunity to view a large variety of resident & migratory birds. The program can be tailor made as per requirement.